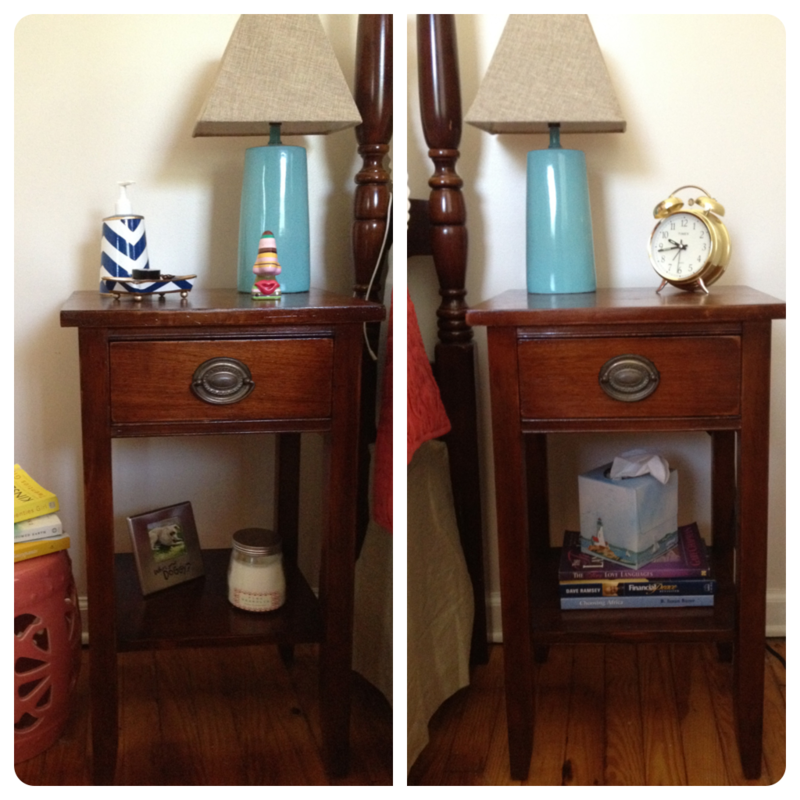 I have been on the hunt for 2 bedside tables for over a year. For much of that year I was using an old telephone table on one side and an end table on the other. They were different heights and depths and were only meant to be temporary. As I’ve been doing more and more updates to the house and making new purchases, I’ve forced myself to let go of some of those pieces that I’ve either had for a while, no longer work for the space or were just hand-me-downs. I sold the end table/coffee table combo that was my first furniture purchase, not because I didn’t love them but they just didn’t go with the oversized sofa and tiny living room I was working with. It worked out in the end because, although they were bought through Craig’s List, I actually sold them to someone I went to high school with who was starting a family and buying a house. They didn’t have much furniture and were so excited to find the tables on CL. I purchased them for $80 over 3 years ago before I left the mountains. They bought them for $200! I know what you might be thinking…but the same set was selling for $250 at a local antique shop so I thought that was a good compromise. Plus, I need to support my DIY obsession with a bigger bank account. Every little bit helps, right? After I sold the end table, I moved my old bookshelf in its place. As you can see above, it still didn’t suit. The heights were closer, but the green tint to the telephone table didn’t go with my coral, navy and teal motif. 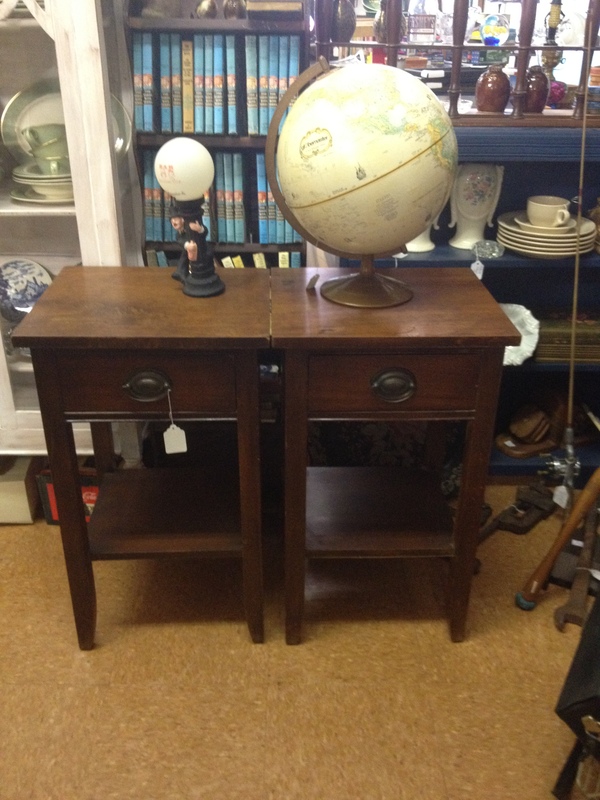 I had looked everywhere from Joss and Main and One Kings Lane to antique shops and even IKEA. No.such.luck. Then one day, Elliott and I happened upon an antique shop I’ve never visited before, Katy Dids (he’s such a trooper – he gets dragged to antique shop after antique shop and never complains). Most of the stuff was old junk, even though I could see potential with a few items that just needed a little TLC and a new paint job. BUT then I saw these and immediately sent a picture to my mom and Kristin, my DIY friend who has become my constant second opinion these days. There were a good many nicks and scratches, but they were exactly what I’ve been looking for. And at $93.50, I just knew I had to have them. I waited a couple of days so I could leave the scene and make sure that’s really what I wanted. Then I went back with $80 cash and planned to haggle a bit. They agreed to my price and told me that they had just gotten them a week ago. They had been on hold the day before, probably just after I last saw them, but the lady never came back. Boy was I in luck! He also told me that they were from the 1930’s. Seeing as I love old things with a story, that only added to my need to get them. I loaded them in my car and brought them to their new home. Note: wear gloves, protective mask on your face and goggles! You don’t want that junk in your nose, eyes and lungs. While sanding, I tried going side to side but found that sanding in a circular motion worked best. I did have to go slowly along the edges to make sure I got every corner. Also, I didn’t press down hard because I only wanted to get the top layer with the (shiny) finish. Since there were a lot of nicks on the edges, I buffed them a little so they were smooth. It actually turned out nicely and gave it that Pottery Barn antiqued look. After sanding every side, leg and crevice, I got a damp towel and wiped the surface until it was clean and all of the dust was gone. Then, I let them dry, which only took about 10 minutes since it was 100 degrees outside, or hot as Hades as we say southerners say. Once they had dried, I left my gloves and mask on. The stain will turn your hands for a week if you don’t and the odor is even more pungent in the heat. 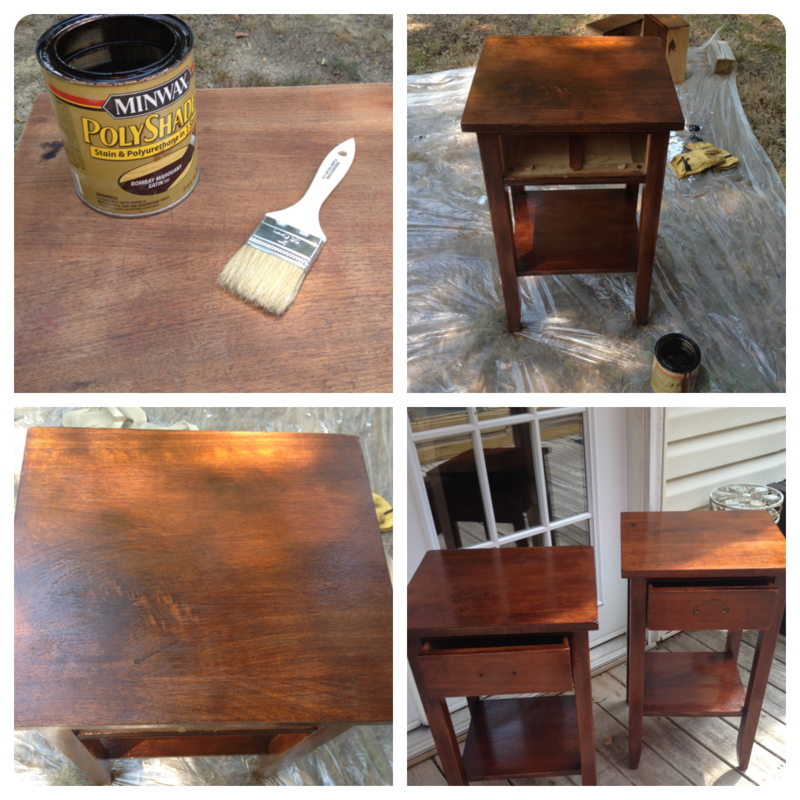 I began staining with a cheap $1 brush from Lowe’s and did thin, even coats over the entire tables. If any stain started to run, I would swiftly brush it out. There were some corners that I’d had to sand a lot so I had to put thicker coats on them to cover the wood that was lighter because of the sanding. I did two coats of stain and let them dry for about 2 hours between coats. The directions recommend 6 hours, but it was so hot that they dried a lot faster than usual. After leaving them to dry overnight, I was able to bring them inside and put them in their permanent home. 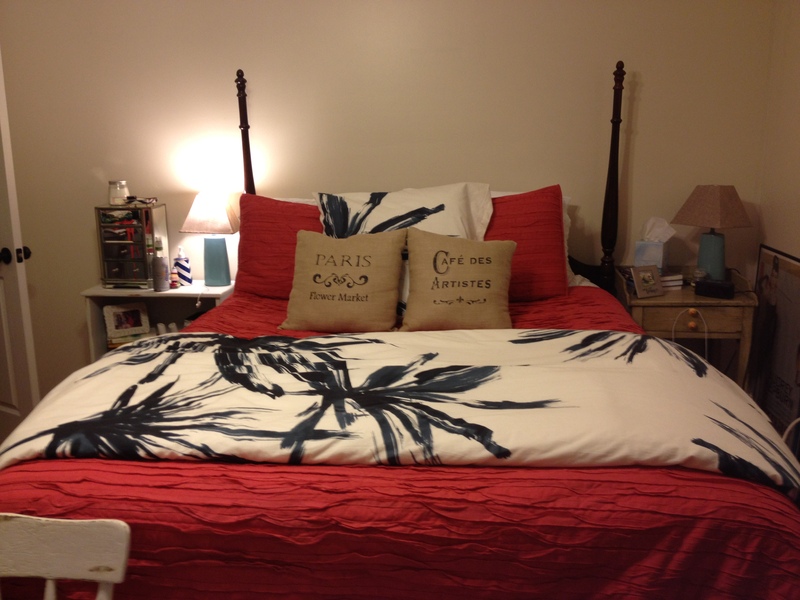 In case you’re wondering, the bedding is from West Elm, the two burlap pillows are from my favorite booth at a local antique shop, the teal lamps and burlap shades are from Target and the navy and white chevron lotion bottle and mini tray are from One Kings Lane. 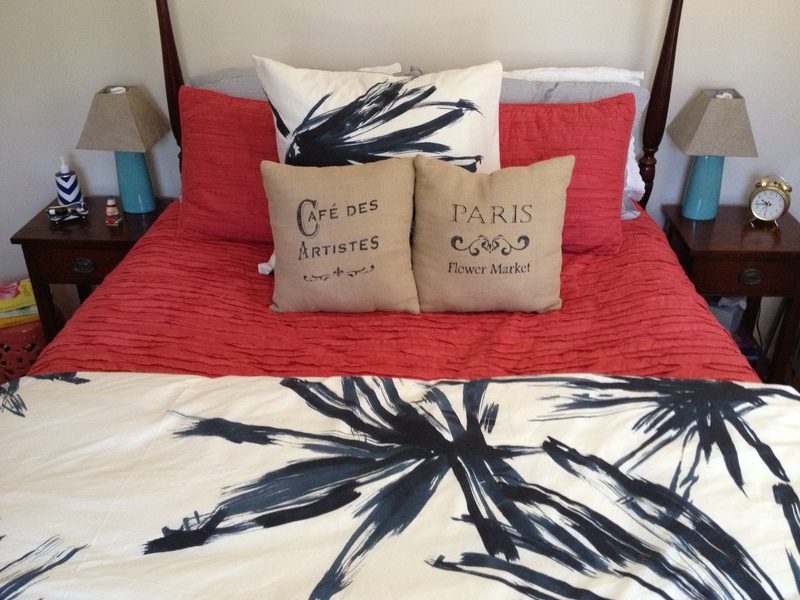 Have you done any boudoir decorating lately? 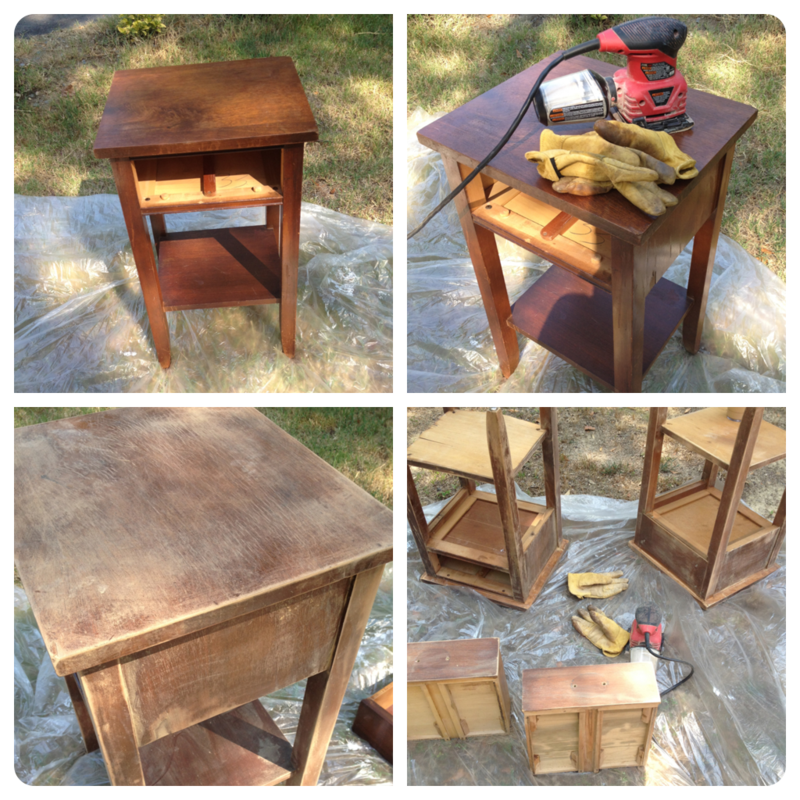 This entry was posted in DIY, Furniture builds & remodels and tagged bedroom, Bedside tables, DIY, One Kings Lane, Target, West Elm by rue3twenty2. Bookmark the permalink.